The area between Alton in Hampshire and Farnham in Surrey was for centuries one of the leading centres for brewing in Britain. From the early history of large estates brewing for home consumption, to the rise of the innkeeper and common brewer, and on to the development of the large multinationals the Wey Valley was never far from the action. Farnham Hops were once the best in the business, and hop growing was a major industry in its own right, along with the malting of barley. Loseley House near Guildford, a 16th century manor owned by the influential More-Molyneux family has a history interwoven with tragedy, which included the murder of a child by her mother in the moat. It is said that the ghost of the mother appears from time to time looking quite distressed. Another lady, this one of a pleasant demeanour, appears dressed in smart Victorian attire whenever a picture resembling her is moved. In 1913, an American tenant apparently fled from the house with her party of guests, and vowed never to return. The original product brewed was ale which was an unhopped alcoholic drink made from fermented malted liquor. Brewing was transformed in the 15th century by Flemish brewers who introduced hops to the process in London, and British beer as we know it today was evolved. Hops have a preservative effect, which meant that the beer kept longer and travelled well without spoiling. Another preservative used in the early days of brewing was brimstone with sulphur which was burnt to produce sulphur dioxide. Such was the initial unpopularity of preservatives that Henry VIII forbade his brewer at Eltham to use either brimstone or hops in his ale. These preservatives did however give the common brewers a better chance at getting a more consistent product and allowed them to keep stock in hand. This enabled the beer to mature for longer, and with stored stocks readily available to meet any immediate demand made for a good commercial environment for common brewers. Until the mid 19th century brewing in the valley was primarily a localised affair, with many of the inns brewing their own ales to service the population in the relatively small towns and villages scattered along its length. Wealthy households who had the space and farms also brewed their own, primarily for their own consumption. Common brewers evolved, again small-time businesses, who sold directly to local publicans The earliest reference to a common brewer of ‘byere’ outside London was a John George who was brewing in Godalming in 1483, although the numbers of common brewers peaked at the end of the 17th century. The Beerhouse Act of 1830, which was introduced to regulate the industry, resulted in a new breed of innkeepers who lacked the skills and even desire to brew. This big increase in demand for outside suppliers eventually stimulated the rapid growth of the large multinational companies that we see today. The result has been the industry largely vacating the valley as the small independent brewers were unable to compete. The history of modern brewing has been steered by a need for breweries to acquire tied houses to guarantee a market, and the industry is currently under review by the EU. 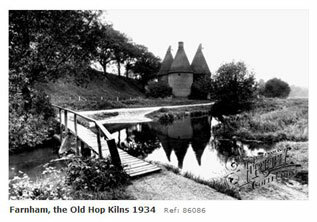 The only surviving breweries of any size in Surrey were in Mortlake, and in Hampshire at the source of the River Wey in Alton. Gradually however the tide has begun to turn as consumers’ tastes have become more sophisticated and more demanding, and a number of small independent breweries have emerged to gain a foothold once again in the industry. A key ingredient in the brewing of beer is hops which provides flavour, and also acts as a natural preservative. The Latin name Humulus lupulus translates as 'wolf of the woods', perhaps an apt illiteration. Hop is a tall climbing plant and when grown commercially complex arrays of hop poles and wires are woven to provide frames for the plants to climb and to provide easy access for the hop-pickers. On theses frames hop plants grow to a height of at least 16ft (5m). 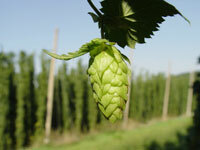 Hop have male and female flowers on separate plants and it is the female flower that produces the cone that is used in the brewing process. The plants flower in July and the cones begin to form. On the inside of the cone petals are glands that produce a stiff oily resin, lupulin, that provides flavour for the brew. A hop plant can remain productive for 10 to 20 years. Being perennial the hop plants die back to ground level each year. 'Bines', the hop-laden plants, are harvested in the valley every September. Traditional harvesting involved cutting at a height of three feet above ground level with the stems being brought in from the field to separate the tender cones from the leaves and stem. On larger hop fields mechanised picking machines extract the cones from the plant and bag them via a short conveyor. The cones are then baked in kilns to reduce their moisture content. Hops when picked have a moisture content of 80% and would deteriorate and rot if they weren’t dried out before storing. This drying process is carried out in oasts or hop kilns and reduces the moisture content to around 10% whereupon the hops are compressed and packed into large sacks. Dried hop bines are often used for decoration and are often seen in woven displays hanging from pub ceilings and walls. Hops also have a long history of use in folk medicine and have been used as remedies in treating everything from insomnia, antibiotics, wound salves and anti-inflammatory compresses, migraines, leprosy and inflammed throats. A famous Wey Valley variety Farnham Hops were renowned for their superb quality and during the 17th and 18th centuries were in great demand throughout England. The Valley today only has 7 hectares of field devoted to hop growing, representing a mere 0.5% of the total acreage (1,278 ha in 2003) (1) in England. Other counties actively growing hops for brewing are Herefordshire (40%); Kent (35%); Worcestershire (19%); Sussex (3%) and Suffolk (2%). 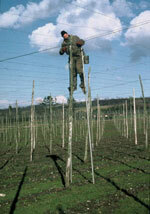 Oxfordshire ceased hop growing after 1998. In 1870 29,000 hectares of hops were spread across 53 counties. Today hop growing is dominated by America and Germany, and changes in beer content with lower hopped variants becoming popular and new methods using hop pellets and hop extracts has resulted in a lack of viability for many English growers. (1) 1 hectare is equal to 10,000 square metres or 2.47 acres. The partial germination of barley provides the second largest constituent of beer after water, providing body and sugar for conversion to alcohol. The grain is first steeped in water and then spread out on the maltings floors and allowed to germinate, regularly being raked and turned to stimulate a good growth. Once ready the germinated barley is removed and heated in a kiln to stop the germination. It is then cleaned to remove any traces of the germinated rootlets and husks of the grain and packed before despatching to the brewers. In the Wey Valley most of the malthouses were small affairs, and evidence primarily through the remnants of kilns and the distinctive pierced tiles which formed the floor of the kilns have been found in old buildings in Farnham and outlying areas in Tongham, Badshot Lea and Wrecclesham, all close to the original hop and brewing industry centre. 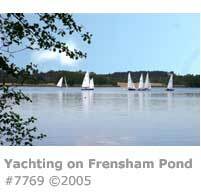 The other ingredients are yeast to provide fermentation, and water for bulk. 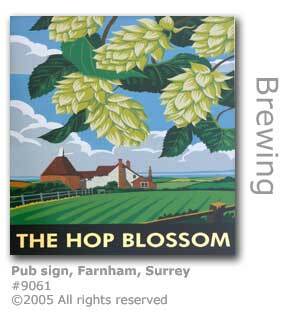 Many English ales take their names from the hop varieties and can stimulate some extremely imaginative descriptions. These are some of the varieties used to provide flavour to ales. Admiral - An English bittering hop. Brewer's Gold – British bittering hop developed in 1934 from Bullion. Occasionally used as aroma variety with noble hops. First Gold – English dwarf hop. A cross-pollination of Whitbread Golding variety and a dwarf male. It is like a spicier Golding, with a higher alpha and slightly richer bitterness. Wye Northdown - Dual purpose hop in England developed in 1970s, with a Northern Brewer-like bitterness, and soft aroma. Brews include: Wychwood's Old Devil and Brakspear's Coniston Bluebird. Northern Brewer – Developed in England in 1934 from a cross between a female hop of wild American parentage and an English male. Grown in Europe and America as a dual-purpose hop, but the aroma is mellow, so is mainly used for bittering in combination with other hops. Progress – Higher alpha English hop developed in the 1960s as a replacement for Fuggles. Often used with Goldings. Brews include: Hop Back's Thunderstorm and Wood Brewery's Hopping Mad. Target - Dusty, earthy English mid-to-high alpha hop bred from Kent Goldings. Brews include: Caledonian's award winning Golden Promise and Hardy and Hanson's prize winning Guzzling Goose Bitter. The basic methods of brewing have changed very little over the centuries, with the exception of modern methods of processing after production. Partially germinated barley is mixed with hot water to make ‘liquor’ in a mash tun. This process converts the grain starch into sugars which dissolve to produce wort. The wort is drawn off once the grains are spent and boiled in the copper, or brew kettle, along with the hops. Once this process is completed the liquid is separated from the hops and cooled. Yeast is then added to convert the sugars into alcohol to produce the beer. The basic difference in British brewing between brewing beer and lager is that for beer, top-fermentation yeasts are used sitting on top of the brew to create a head of yeast protecting the beer from the air. Conversely for lager, yeasts which sit at the bottom of the fermentation vessel are used. Before hops were introduced into brewing, ale was produced from malt without the use of this natural preservative, and although the term 'ale' is used widely today strictly speaking all brews using hops should be described as beer. 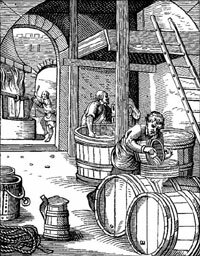 Ale was the drink of the Anglo-Saxons and English, with the technique for brewing beer using hops being learned from the Germans in the late 14th century. Beers are described according to their level of alcohol (Alcohol By Volume - 'ABV') and their likely bitterness (International Bitterness Units - 'IBU'). Bitter. Far more delicate beer than its name suggests with Adnam's Bitter a good example. 3.5 - 4% / ABV 20 - 35 lBUs. Best Bitter - Extra Special Bitter. As per 'bitter' but stronger in alcohol and flavour with Brakespear's and Fuller's ESB good examples. 4.5 - 5.5% ABV / 28 - 55 IBUs. Pale Ales. Lighter coloured medium bodied beers with low to medium flavours of malt with strong fruit flavours and high hop bitterness. Usually sold in bottles. 4.5 - 5.5% ABV / 20 - 40 IBUs. India Pale Ales. Strongest of the 'bitters' and were originally brewed specifically to ship out to British soldiers and administrators in India in the 19th century. Brewing was difficult in India in that era and there was no refrigeration so the higher alcohol content (then at 5% ABV) and high hop content ensured that the beer preserved well. Many IPAs today are of a lower alcohol content. 4.5 - 7% ABV / 40 - 60 IBUs. Mild Ale. Historically a higher alcohol 'quaffing' beer although by the 20th century it had become a less strong cheap low-hopped pint for the miners and steelworkers of the Midlands and north of England. 2.8 - 4% ABV / 10 - 25 IBUs. Porter. Developed in the 18th century Porter became the first British mass-market beer and was a cheap combination of three beers with the bulk being a fresh beer fermented in large wooden vats with two older ales added to stifle the sharp flavour. Mellow brown and lower alcohol content than Stout and has a slight wine-like oxidised twang. 3 - 4% ABV / 20 - 30 IBUs. Stout. Originally known as 'stout porter' it is usually associated today with Guinness and became popular during the First World War. Irish Dry Stouts, also produced by Beamish and Murphy's, have a dry roasted bitterness and a good head and have an ABV of between 3.8 - 40 ABV. Mackeson brew a sweet Stout with a sweet malt chocolate flavour. Barley Wine. A wine-like beer high in rich malt flavours. 6 - 12% ABV / 25 - 35 IBUs. Lager. Of Germanic origin and adapted by the Czechs of Pilzen who produced it as a clear beer. Easy drinking light flavoured beers and use a totally different type of yeast to all the other types of beers which work more slowly and under cooler temperatures. 4 - 6% ABV / 10 - 25 IBUs. Beers served from the cask or keg (2) in pubs are drawn in distinctively different ways from the south to the north of the country. In Scotland and the north of England, beer is dispensed from a 'swan neck' dispenser through tight holes to generate a creamy head for the poured beer. In the south of England, where brewers tend to produce hoppier beer, the beer is drawn through a less vigorous dispense system to preserve the flavour and presents as a flatter-topped pint. A prime example in the valley of a successful independent is the Hogs Back Brewery in Tongham near Farnham, the original centre of the hop growing industry. The brewery was established in 1992 in 16th century farm buildings and has grown from strength to strength now boasting an output of 140 barrels (40,000 pints) per week which reaches over 500 outlets and provides 20 different beers. Today (2006) in a male-dominated industry the Hog's Back Brewery has a female brewster Mo 'Dyna-Mo' Zehier and has helped the brewery win many awards. The brewery has remained fiercely independent and beer enthusiasts are encouraged to take a tour of the brewery and sample the ale for themselves. 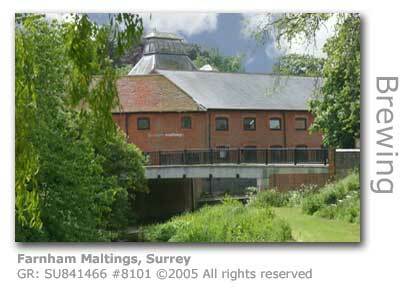 A small independent brewery operating from a farm in the Tilling Bourne valley, one of the River Wey's major tributaries, won (August 2006) bronze distinction in the Best Bitter category awarded at the Great British Beer Festival. The national festival has been running for 29 years and is generally regarded as representing the best in quality of British brewing. Founded in 2004 by Ross Hunter, who gave up his career in IT to chase a dream, Surrey Hills Brewery won the accolade with their brew Shere Drop. The winning bitter weighs in with an ABV (1) of 4.2% and is described by the brewery as 'pale in colour with a subtle hint of grapefruit and lemon in the aroma'. This is not the first award for the fledgling brewery which has won gold and 'beer of festival' awards at other festivals during 2005 and 2006 for its flagship brew and also for its other ales, Ranmore Ale, Albury Ruby and Gilt Complex. Located at New Scotland Farm (GR: TQ063500) Staple Lane in Shere the brewhouse has been built in the former milking parlour. The brewery produced its first output in June 2005 and utilises purpose-built equipment including the mash tun, fermenter and copper. (1) ABV is the percentage of Alcohol By Volume. An ABV of 4.2% represents 7.36 proof UK and 8.4 proof US. The brewery celebrated its millionth pint (February 2009) at a time when the Campaign for Real Ale (CAMRA) has reported that 39 pubs are closing every week across the country. CAMRA cite that the current economic crises and the high tax burden being imposed by the government on the industry are to blame. In 2008 the tax on beer was increased to 45p a pint, which when combined with employment taxes and VAT brings the tax cost of a pint to around £1 per pint.